Students across several academic disciplines at Castleton have immersed themselves in the spirit of giving, spreading cheer to those in the community this holiday season. This annual tradition originally stemmed from a desire to become a more active and positive community partner in the eyes of Castleton residents. 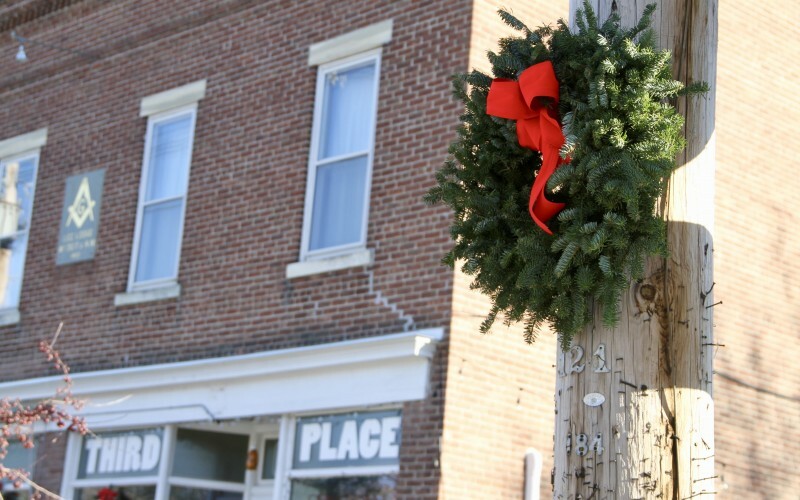 Rutkowski purchases the wreaths locally with his personal funds and volunteers his time, along with nearly a dozen students and volunteers, placing the wreaths at various locations throughout Castleton, including the elementary school and village schools. To thank the volunteers for their good deed, local business owner John Rehlen treats the students and volunteers to free pizza and drinks. Recognizing that nearly 60,000 Vermonters live in food insecure households, Professor Melinda Mills’ Introduction to Sociology class is addressing food insecurity in our community by collecting canned food items to donate to Castleton Cares. This non-profit organization operates the Castleton Food Shelf, which is 100 percent donation based. The class set up boxes across campus to gather the items for local families and individuals in need. Three years ago, Professor Dave Blow replaced his usual end-of-the-semester project focusing on journalism in the community with a more intimate project, raising money to adopt a family of three for Christmas. Blow and his students raised more than $1,000 that year and were able to provide an experience he calls “magical,” purchasing toys, clothes, and food for the family, with money left over to help the mother with the electric bill. The class adopted another family the following year, and worked with at-risk single mothers and their children last year. Blow estimates his class has raised more than $4,000 since 2015. This year, Blow and his students are working with the Vermont Achievement Center (VAC) to provide toys and clothing to children in need of all ages. The families identified items their children would want for fun, as well as necessities, which ranged from items including coats, snow pants, and winter boots to car seats, bed sheets, and diapers. Blow said that he and his students will go shopping for these items in the coming week and will spend time organizing and wrapping the gifts, creating a pseudo-Santa’s workshop in their Leavenworth classroom. The class will then deliver the gifts to VAC, hosting a party for the children and their families.